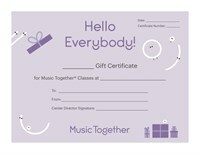 Give the gift of Music Together® to a loved one or friend! Gift Certificates are available for class tuition! Perfect for any celebration: baby showers, birthdays, Mother’s and Father’s Day, Christmas, Hanukkah, etc. The gift certificate will include a personalized code and instructions for redemption. All gift certificates will be sent via email. Gift certificates have no cash value. Give the gift of music to your loved ones!